← I Exercised at Home for 25 Years and So Can You! Sustainability is the process of adopting a sustainable lifestyle that ensures the conservation and security of the Earth’s natural resources. Scientists are warning that humans are depleting these resources at an alarmingly fast rate, one that outstrips the planet’s ability to renew them. The sustainability philosophy is that we must not fill our own current needs at the expense of the needs of future generations. The good news is that many of the changes you can make will also save you money and may even help you live a healthier lifestyle. This means that you are helping yourself when you live a more eco-friendly life, as well as the wider community and the planet. You will see the positive differences close to home and will be able to enjoy the benefits. Here are just a few ideas to get you started with going green. Look at applying these strategies in your home; you will probably find that you can influence your immediate circle of friends and relatives and possibly your local community. Reduce your carbon footprint – and save money at the same time. Reduce your dependence on fossil fuels by driving less and using public transport or walking; reduce your energy consumption by turning off lights to empty rooms and appliances at the wall; choose energy-efficient appliances and alternative power sources; change to CFL light bulbs. Consider the household products you buy – reduce the toxic chemicals in your home and improve the health of your family and the planet. Cleaning, garden, washing and personal products often contain ingredients that are considered poisons on their own or are petrochemicals derived from oil. People lived happy and healthy lives before the advent of the huge range of cleaning products that currently adorn our supermarket shelves; their clothes, bodies and homes were perfectly clean as well. Look for eco-friendly products with limited recyclable packaging, low-toxicity, no petrochemicals, are biodegradable and phosphate-free. Read food labels – we have become dependant on processed foods in our busy lives but in the process have lost much of the nutrition of the food. Processing removes nutrients which provide flavor and so manufacturers put back chemical additives to improve the flavor and texture. Avoid artificial flavors and colors; you might be surprised what they are made from. If you cannot pronounce an ingredient, you possibly don’t want to eat it. Processed food uses vast amounts of energy in its production, making it an unsustainable commodity. Cook at home using fresh ingredients – home-cooked food is generally healthier, more nutritious, less fattening and uses less energy. Involve the whole family in menu planning and meal preparation. Keep take-out as an occasional treat. Source your ingredients locally, where possible, to reduce the miles the food has traveled to get to you. Source organic produce; you might pay more but you will appreciate the great taste and nutrition. Grow some of your own food – whether you have the room for a vegetable garden or keeping a few chickens, a balcony pot garden or windowsill herbs, by growing some of your food, you are further reducing food miles and eating healthier. By avoiding the use of chemical fertilizers and pesticides, you are also eating cleaner food and preventing these toxins from contaminating both you and the natural environment. Reduce your “stuff” – we are constantly being encouraged and enticed to buy more “stuff” in the consumer-driven societies in which we live. Stop and think before you buy; do you really need it or just want it; do you have something already that will do the same job; can you buy the same item second-hand? Reuse and recycle – consumerism has taught us to throw away anything that is broken or that we no longer want or need. It’s easier to go out a buy a new one, right? Unfortunately, this is wrong for the environment. The earth is staggering under enormous amounts of trash in land-fill, much of it able to be recycled. Sell or give away anything you no longer want; shop at second-hand stores and save lots of money; find another use for empty containers, old clothes etc. Use eco-friendly alternatives to harsh chemicals –– When your lawn is weed-ridden and dwindling away into a brown, dying wasteland, it’s tempting to buy the cheapest weed spray on the shelf at your local Home & Garden Center. However, there are eco-friendly alternatives such as weeding by hand, burning your weeds (use caution) or creating natural barriers to keep the weeds out. 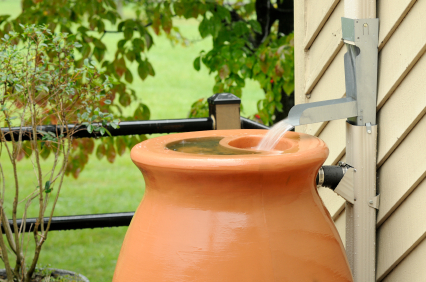 Conserve water – shorter showers, only run full dishwashers, collect washing water for the garden. These are just a few sustainable living strategies that you can implement in your home to create a healthier environment for yourself and your family, to help the planet, and set the sustainability ball rolling in your local community. So, how do you try to live sustainable? We have big bins for garbage and recycling that we keep in the garage. In our kitchen we have smaller garbage cans both for garbage and recycling. We’re even teaching our two year old which container is for what. It definitely helps to make sure we recycle everything possible that our collection takes. That is great. I am glad to hear you are setting a good example for your children and teaching them how to be environmentally responsible. Preparing the next generation to do their part will have a huge impact. We would love to reduce the amount of garbage we generate however it is difficult to do so where we live. Product packaging is the biggest problem and buying bulk foods is not really a realistic option as we don’t have access to foods we like. I think this is where the government needs to step in and pass legislation reducing the amount of packaging. We recycle everything we can and use drip irrigation for our gardens. Governments definitely need to step up. I totally agree. Until there is some kind of regulation saying a product can’t be sold because it has too much packaging, we aren’t going to make real headway. Try buying more fresh foods like fruits, veggies, and nuts, and you can cut down on a bit of the packaging. I think you have to be a good steward of the earth, yes, but you can’t do everything. I think you have to be balanced in your approach to the earth. It shouldn’t be made an idol, nor should we believe it will last forever. It says in the Bible that the earth is groaning…it isn’t getting better, it’s getting worse. I don’t think we should contribute to this degeneration by littering, or not being good stewards–but there is definitely a limit to how much I will care. And whenever the government steps up, they ruin things. So, I don’t think having the government step up will do anything but worsen the environmental problem you speak of. Interesting view Jon. You make some interesting points. I must say that I would do all I can to look after our planet and I will always care a lot about the planet. You might be right about governments though. Sometimes they do make things worse. We have a recycling bin, composting bin, rarely drink bottled water, have a garden (that is frozen over now) and ‘recycle’ some water from the dehumidifier and such. However, we drive wayyyyy too many miles. The only thing I would say we do really well on is reducing the amount of garbage we put on at the curb each week. Most things are either recycled or composted. Sounds like you are doing great if you ask me. I love that you generate very little trash. That kind of thing can really add up over time in benefits. Do your best with the driving thing. Maybe you can get a more efficient car down the road as prices go down. We don’t drive excessively. My wife’s truck has 70,000 miles on it, and it’s 10 years old. We do have rain barrels and we make sure to bury all of our pop cans in the neighbor’s garden. Well, except the last bit. Lol!! Glad to hear you are doing so well. 70,000 miles in 10 years is great!! Definitely something to be proud of. We also try to limit our mileage as much as we can. I’m glad you mention reuse along with recylce. Recycling is great, but if you can fix and reuse something that’s broken, even better! Absolutely. There are so many things that can be repurposed. We incorporate recycling and fresh foods into our daily lives. Small changes work well! Great to hear and yes you are right. Small changes do add up. We have separate bins for compost and other waste. Also, about two years ago we started cooking everything from ingredients, including making our own bread. Shopping for the weekly menu also eliminates waste – now we hardly throw food away which is a great imporvement. One area where we can do better is ‘the stuff’ – we have too much stuff and I have been trying to reduce it but feel like I am pushing a stone up a mountain. Sounds like you are making great progress and have made some great positive changes. We do a lot of the same things in our house. It is funny you say you are working on decluttering because that is one of the goals I have this year too. We have two rooms left in the house. I am hoping to finish this winter. It seems like more and more people are trying to grow their own vegetables and fruits. Once you get over the initial start of gardening, there is much benefit you can gain from it. It does require some physical activities and work. We have been gardening the last couple years and have been quite successful. I really enjoy it. I love being able to go in my yard and get what I need for dinner. It is so invigorating. And yes once you get started that first year, you are set going forward after that. We try and do a little bit of everything, and diversify our sustainability efforts. Water is a major area that we want to improve. It’s incredibly expensive, and seems like we waste so much of on lawns during the summer. I second this. Having a pool in your backyard really makes you conscious of water-usage. Absolutely. I never grew up with a pool but husband did and he admits it is not the best for the environment. We had a really hot summer this year and we actually avoided watering. We thought it would be a good way to have our grass establish good deep roots. It was brown for quite a while but once fall hit it greened right up. We saved a ton of water this way. This year we’ve gone more towards drip irrigation for the flower and vegetable beds. Much more economical than setting out a sprinkler. A higher mowing cut for the lawn is also less stressful for the grass, encourages deeper root growth, and therefore requires less water. We also cut our lawn high. It seems to do a lot better. Cool thing with the drip irrigation. How are you doing that? Did you buy a system and if so which one. Would it work with pots too? I am currently watering with the hose and wine bottles at the moment but I am open to new ideas. Thank you for defining sustainability. I have become more conscious of my water consumption recently. I’ve been trying to reduce it. I know my overall carbon footprint could be smaller too, but I’m taking baby steps. Glad to hear you have noticed where you can make an improvement and working to do so. That is huge. So many people don’t even look for where they can make changes. Great tips and thanks for the reminder. I currently recycle my plastics and use public transportation quite a bit. We need to cook more. I also need to take shorter showers. But that’s when I do the most thinking for writing topics! I am guilty for long showers too. It is just such a great way to warm up and wake up in the morning. Glad you are trying to make some positive changes.